The Temple Within Radio and Media is dedicated to presenting life-enhancing topics for body, mind, spirit, and emotions in a positive and inspirational way. Carl Franklin is a Metaphysical Researcher. He holds a Master’s degree in Theology and Psychology and is a Coptic minister. While studying for his counseling degree, he became interested in utilizing both his conscious and subconscious mind. Practicing self-hypnosis and meditation has allowed him to go beyond the 5 senses. He is a dowser ... See More with the ability to communicate with the Higher Realms. In his Life Script reading practice, he is able to tap into the Akashic record of individuals helping them to remember their life’s plan. As an international speaker and workshop presenter, Carl lectures and teaches on various topics such as: Spiritual Parapsychology, The Crystal/Indigo Children, The Ascension Process, The Spiritual Realm, Our multi-dimensional selves, and 5th Dimensional Christianity. 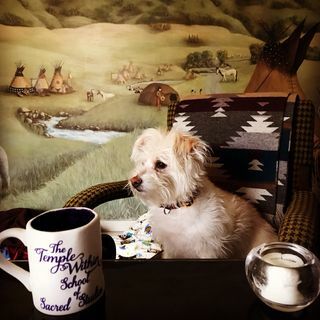 Denise Iwaniw-Francisco is an author, spiritual teacher and owner of The Temple Within LLC and the Temple Within School of Sacred Studies, which were founded in 2000. She lectures and teaches in the United States and abroad in a variety of areas, encompassing the practices of spiritual development and balanced living. Denise shares her ... See More wisdom regarding spiritual pathways and the life journey with an open heart and gentle humor. Denise has written several highly successful books and produced many guided visualization audios. Denise is the founder and president of Gathering Thunder Foundation a 501c3 nonprofit organization dedicated to the preservation of Native American culture, spirituality, languages and People. This popular internet radio show hosted by Sandra Harrick of Soul Awakenings LLC and Denise Iwaniw Francisco of The Temple Within LLC has now evolved into a monthly internet radio show via Spreaker. Since that time, ... See More Sandra and Denise have come together each year in New England and in Michigan to teach, lecture and enjoy life’s adventures. Amber Covell is the founder of Soulshine Wildlife Center, a 501(c)(3) nonprofit public charity with a focus on rehabilitating and caring for injured and orphaned wildlife in Michigan, USA. Join author and show host, Denise Iwaniw Francisco, for an inspirational program on The Temple Within Radio and Media Network. Dellmarie Dullknife Bradfield is an Oglala Lakota Elder, raised on the Pine Ridge Indian Reservation in South Dakota. Join her each month as she shares sacred teachings and ways of balanced living.